Ok, so what we often call a gyrator is not technically a gyrator. This page is named after the circuit popularly referred to as a gyrator, not an actual gyrator. I’m developing a little PCB for a simple gyrator circuit to be used in an upcoming integrated preamp project (2nd stage of phono circuit: needs gain and low enough output impedance to drive a volume pot). The thing that’s most intriguing to me at this point is how a gyrator lets you set an anode voltage rather than anode current (but still maintains a high impedance for AC). On paper, this looks more flexible in rolling compatible pinout tubes than setting a current. And what the heck, it’s a new circuit to try! See the new page here! Having a small stash of #26 tubes and always being curious about it as a preamp tube, I’ve embarked on some preliminary research of successful implementations. There’s a huge thread on diyaudio.com, but some choice references are Ale Moglia’s iterations and Kevin Kennedy’s classic implementation. In general, the prototypical 26 preamp is a fairly simple single tube grounded cathode gain stage. Perhaps this topology simplicity is why there is so much experimentation in the support circuits. Gyrators, current sources, and line output transformers all make an appearance as the anode loading strategy. The B+ supply is similarly diverse: SS regulators, tube regulators, VR tubes, etc. It seems the popular consensus is for fixed bias: using the filament current drop across a resistor to set the cathode current. But there are fixed bias and traditional cathode bias implementations as well. All of the above is fairly comfortable stuff coming from the general tube world of 9 pins and octals. The filament (AKA heater) supply, on the other hand, is something new for those used to indirectly heated tubes. In indirectly heated tubes, the cathode is a sleeve surrounding the filament heating it; this mechanical separation helps prevent heater hum (50hz or 60hz AC) from entering through the cathode. In a directly heated tube, on the other hand, the filament and the cathode are one and the same. A low voltage SMPS and a dropping resistor requires no explanation if you know Ohm’s Law and can find something quiet with the right ratings (here’s a good read on this topic). Voltage regulation and current sources/sinks have been covered in principle a few times in projects and general information pages as well (see links above). Mixed strategies are what have piqued my interest the most. Kevin Kennedy’s article suggests a 7805 followed by a LDO CCS to supply #26 filaments. From what I can gather, this is the principle also behind the Ronan Regulator (which I see mentioned frequently but I can’t seem to find the ‘official’ schematic). In these strategies the voltage regulator makes a first pass at cleaning up the raw DC and absorbs some power dissipation. The constant current source follows and sets the filament current to a fixed value (in turn setting filament voltage as per Ohm’s Law). Including a CCS to limit current has a protective side-effect as well: cold filaments are otherwise eager to soak up a lot of current, potentially stressing the power supply and filament/cathode itself. Rod Coleman also has a very interesting approach to DHT filament regulation. You can find boards/kits for sale here (no commercial interest, just admiration for the design). This circuit feeds the filament from the ‘positive’ end with a gyrator, also known as a cap multiplier in this configuration. The transistor Darlington pair sees a low-passed capacitor at its base and works to amplify this smoothed signal at its low impedance emitter (effectively making the cap seem much bigger than it really is). This doesn’t regulate voltage because the gyrator doesn’t have a fixed reference, but it does reduce ripple drastically. The ‘negative’ end of the filament is connected to a constant current sink. This is a ring-of-two CCS design which will have a lower operating voltage requirement than a cascode CCS or many ICs. Because our current is relatively high, low dropout voltage is a benefit in reducing overall power dissipation. The filament is fed a low ripple voltage with a CCS setting the current. It’s simple, but reports seem universally positive for Coleman’s regulator approach. Whether filament bias or cathode bias, the filament supply should be left floating (it finds ground through the bias resistor or grounded cathode). There’s little reason to reinvent the wheel here as far as I can tell. Although I’m still casually reading, I’ll more than likely try one or more of the above approaches to powering the filaments in my upcoming #26 project. More to come on this project as parts arrive and the ideas ferment. Pete Millett’s Starving Student was one of the first amps I ever built completely from scratch. 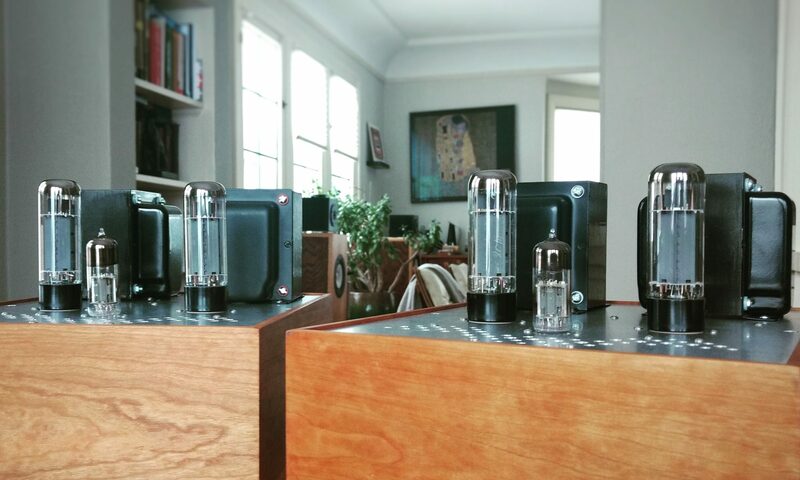 Unfortunately, the 19J6 tubes have become rare (or at least no longer dirt cheap) due to all the bright eyed DIYers scooping them up to build amps. I think the world needs another <50V tube amp for beginners, so I’m designing one. Like the original, it’s an oddball tube with a MOSFET buffer and an off-the-shelf power brick (same brick, in fact). Millett is one of my personal tube heroes. This is a tribute. Full write up coming soon (and parts values subject to change once tested).